US internet users spend more time on Facebook than any other website. That's according to the latest findings by media research house Nielsen. Nielsen's "State of the Media" report for the third quarter of 2011 tries to capture a snapshot of the social media landscape in the US. Among the key findings is the fact that social networks and blogs account for nearly a quarter of the time that Americans spend online. Given that social media now reaches more than 80 percent of adult internet users, such stats have massive implications for the world of online retail. The report found, for instance that some 60 percent of people who used "three or more digital means of research for product purchases learned about a specific brand or retailer from a social networking site". Of these consumers, 48 percent responded to a retailer's offer posted on Facebook and Twitter. Perhaps even more revealing is the fact that 70 percent of active online adult social networkers shop online, 12 percent more likely than the average adult internet user. The report also found that users over the age of 55 are driving mobile growth of social networks and that, while men are still the predominant users of the internet, women have taken the lead in social networking. 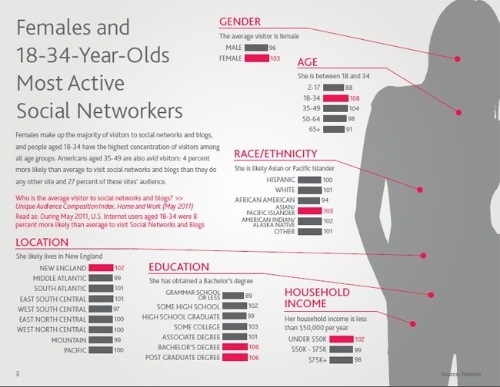 In fact, the majority of the visitors to nine of the top ten social networks in the US are women. The notable exceptions to this are LinkedIn and Wikia, which are the only sites where the percentage of men exceeds the percentage of total active male users (47 percent). Another exception not mentioned in the report is Google+ where nearly all of the early adopters were men. Also of interest is the fact that there is a correlation between a user's level of education and the kind of social network they visit. A quarter of visitors to popular blogging platform WordPress, for instance have a bachelors degree, while LinkedIn is three times more likely to be visited by users with a post-graduate degree than average. Personal computers still remain the most prevalent means of gaining access to social networks and are used by 97 percent of consumers. Mobile still lags somewhat behind but is fast gaining traction. 37 percent of users access social networks through their mobile phones, with a select few using tablets, e-book readers and handheld music players. Such figures are borne out by the fact that social networking apps went up 30 percent from the same quarter last year to become the third most used type of smartphone app. The report also found that active social media users are influential offline. This is, in part, due to the influence they have in recommending and reviewing products. Active social network users are also more likely than the average internet user to be "found at political rallies, professional sporting events and working out at the gym".